Yeah. 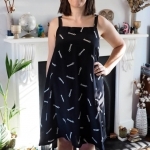 This dress is a bit off-piste from my recent makes, and not exactly adhering to my ‘sewing an everyday wardrobe’ guideline. But I think my face says it all. KITTEH DRESS! This fabric, man. As soon as I saw it I knew I needed a frock out of it. 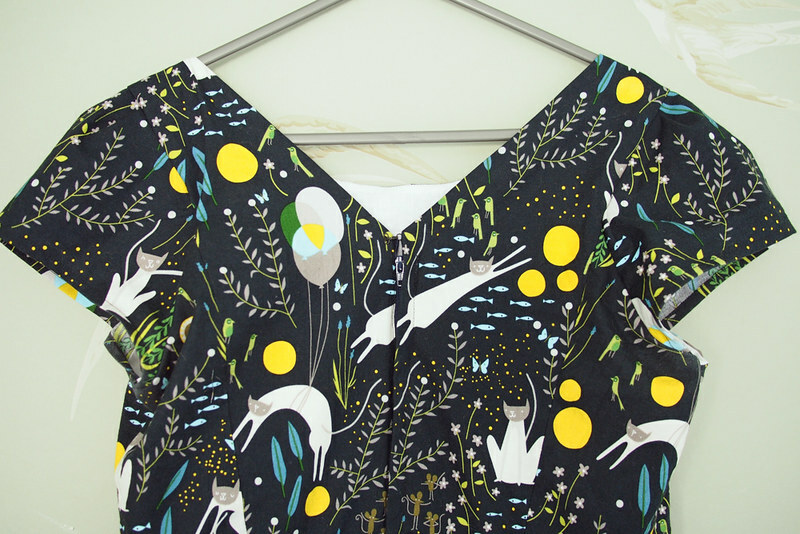 It’s Lizzy House’s Kitty Dreams: her entire collection of cat-themed cottons is adorable, but I thought this dark green print was the most wearable. I bought half of my fabric from Etsy and realised I didn’t have enough for a dress (damn you, narrow quilting cotton), so quickly bought another 1.5m from Backstitch to finish up the skirt. This fabric is clearly a poular choice for frocks as Lizzy House ran a competition with some really cute entries. I just love this pattern, too, though I would never have guessed from the traditionally uninspiring envelope styling. 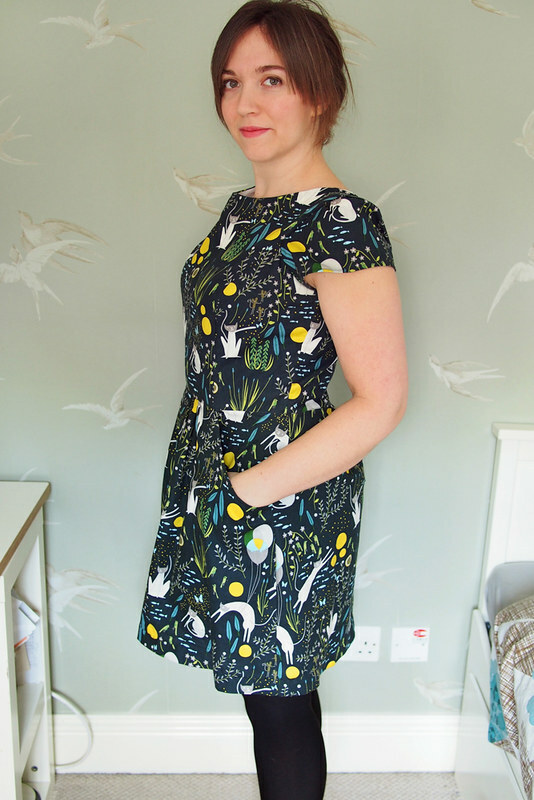 It’s Simplicity 1610 and features a princess seamed bodice, pretty neckline with boat front and V-back, cute square-pleated sleeves, and those brilliant single-piece yoke pockets that I ripped off on my trousers. The instructions are good, though I would have liked a bit more guidance on how to finish the bodice lining to leave a minimum of raw edges showing. Fitting went fairly smoothly. I tend to choose the size just above my measurements for woven dresses as it’s easier to take in than out. I basted together the bodice lining first to check the fit and found I just needed to sew at 5/8″ rather than 3/8″ seam allowance to get a good fit. 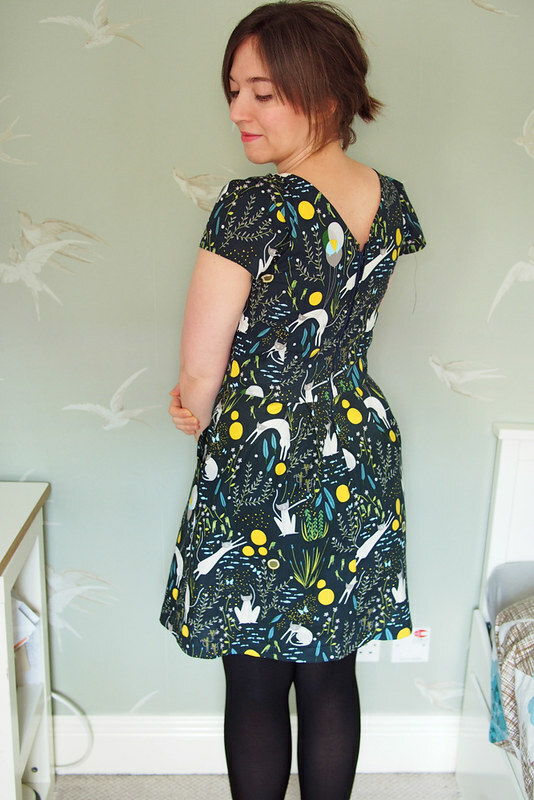 Unfortunately the final dress gapes a little around the neckline and feels too loose across the shoulders, although it’s not showing too much in the photos except this profile angle. I find it’s really hard to diagnose fit issues around this area with a zipped-up dress as you’ll never know how it’ll sit until the end! Next time I’ll pinch a dart out of the front neckline pattern piece before cutting the fabric. Is there any way to retroactively fix this without having to take my bodice apart? Maybe a liberal bit of steam-shrinking would help. 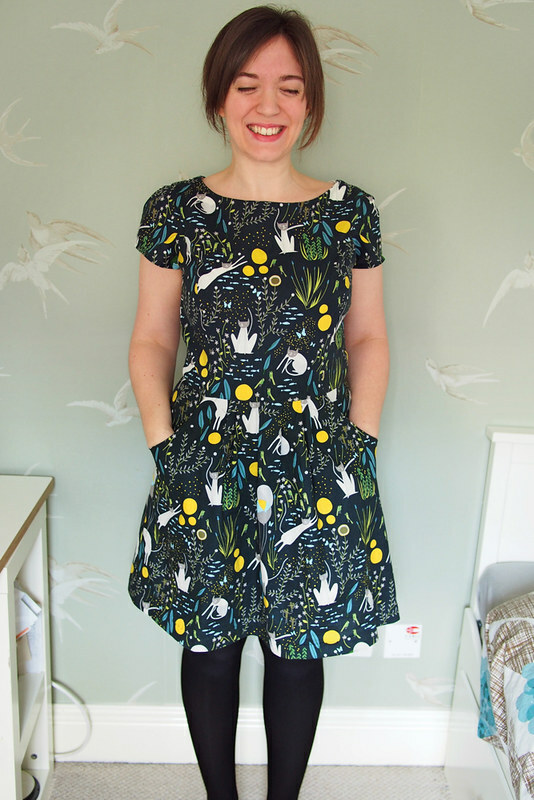 I made a proper effort to make this frock as beautifully constructed and finished as I could. 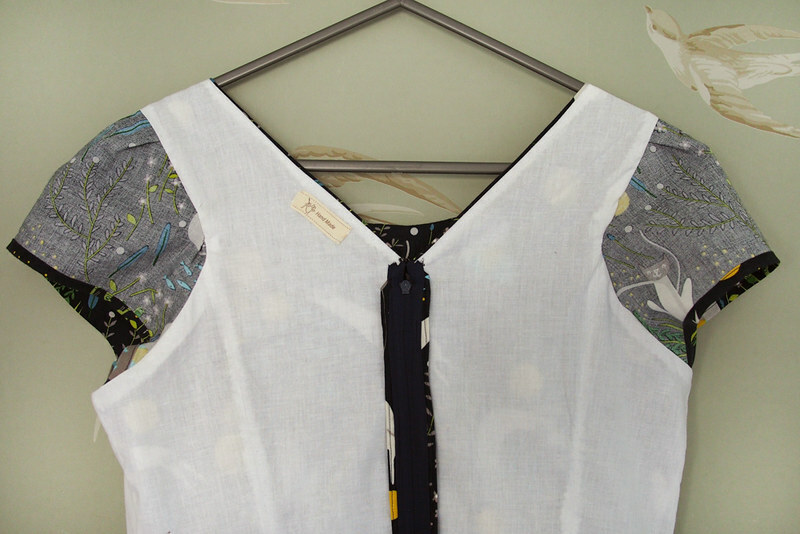 The bodice is lined with white cotton, and I even ‘invented’ a slightly OTT method to finish the armsyce with all the raw edges tucked inside (basically doing the burrito method but with the sleeves tucked into the seam, too – quite fiddly, wouldn’t recommend). The back has a lapped zip, which I inserted using the really simple instructions in the Christine Haynes book I received for my birthday. It does have a hook and eye at the top, but I can’t reach it on my own! Also, yeah, I didn’t pay any attention at all to pattern matching as the repeat is really big and I didn’t fancy investing in extra yardage. I think it’s sufficiently random that it’s not a huge deal. I decided to not use my overlocker at all, so all the raw edges are pinked. I’m interested to see how this holds up vs overlocking after a few washes. 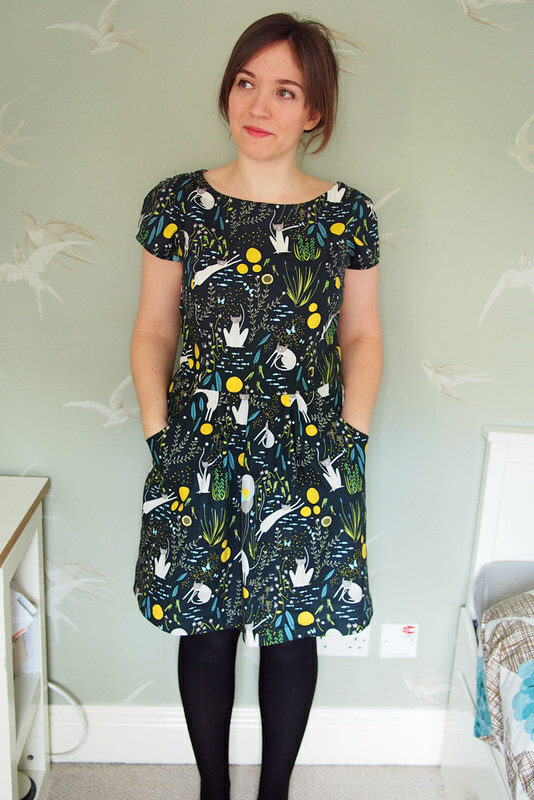 This dress is also my first entry into the Sew Dolly Clackett competition! It probably won’t be my last, but I think this one had enough Roisin-appeal for me to consider entering it. I’m even wearing matching kitty shoes here for extra points, but I wasn’t brave enough to pose outside my front door so the mucky back garden will have to do. I love this! You’re right; I never would have looked at that pattern twice based on the envelope. I also love how you’ve styled the print…somehow it doesn’t look fussy, but really cool and chic! PS- Your cat is the cutest. Lovely dress! I love the way the back is cut! So pretty! I like that its not overly cutesy, great job! This is sooooooo cute! Well done! Aw, what a gorgeous dress. Yes, your expression in the first photo really does say it all. You look so happy in this dress! Love the fabric and the finishings. And I agree, way to see past the envelope! This is amazing! 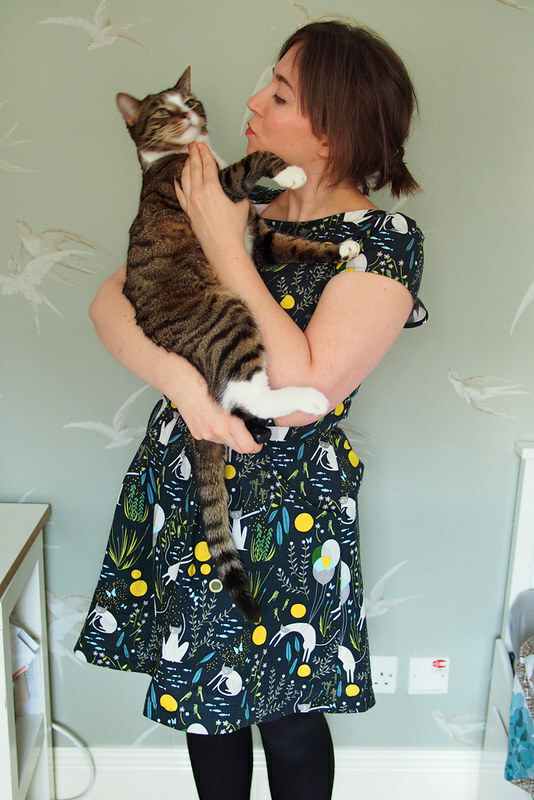 Gorgeous dress and gorgeous kitty! 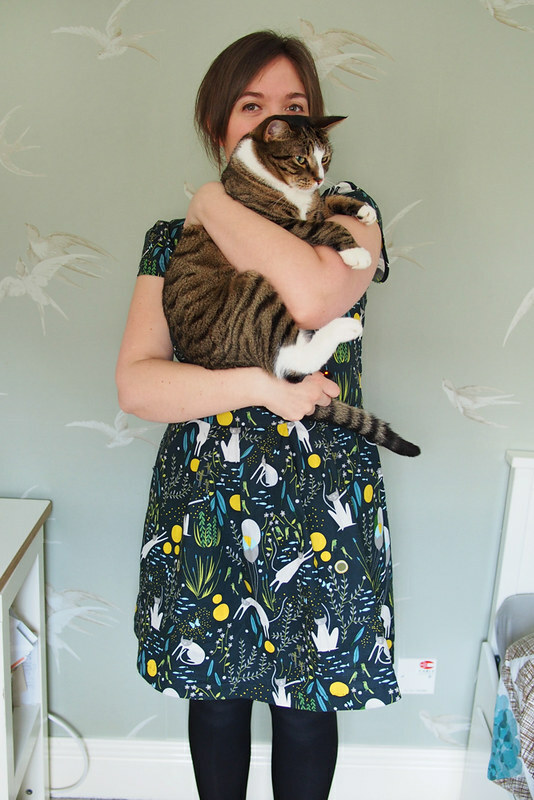 Gah, this print is purrfect (sorry). The colors are stunning and the kitty is having a grand ole time flipping around. May have to copy. Great dress! I’m inspired to dig this pattern out of my stash and give it a try. Lovely! the print is so cute and agree that I would.t have looked twice at the pattern envelope. Very cool dress finished beautifully! 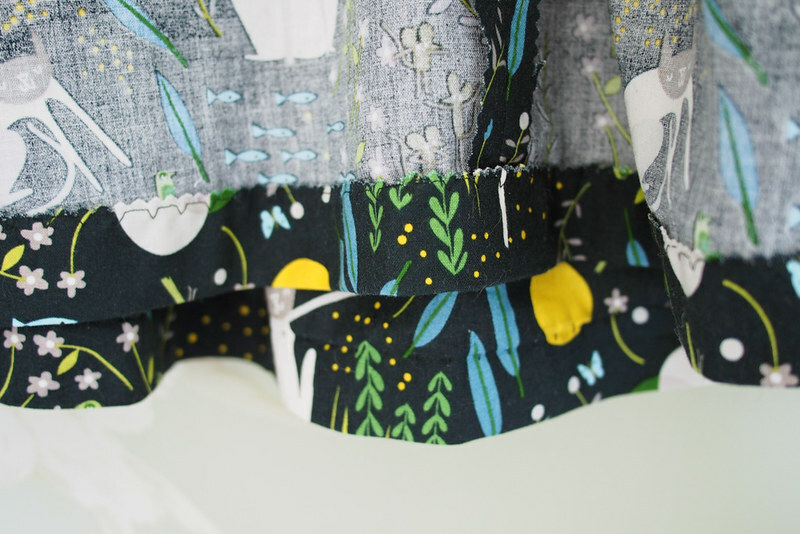 I like the yellow dots against the dark green fabric background. Its lovely. So cute. I haven’t tried pinking yet but i hear it’s quite effective. 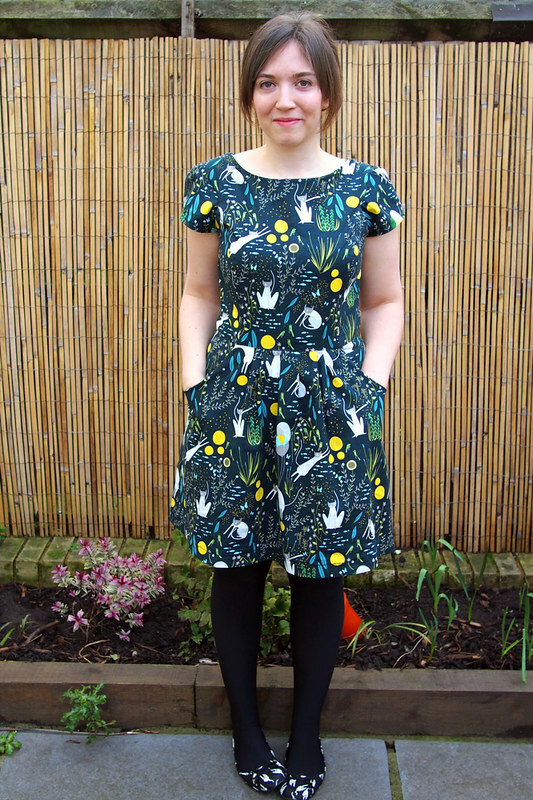 I love this dress – I think it’s my favourite make of yours so far. Obviously the fabric is super cute but I think the cut of the dress is really flattering and looks lovely on you. 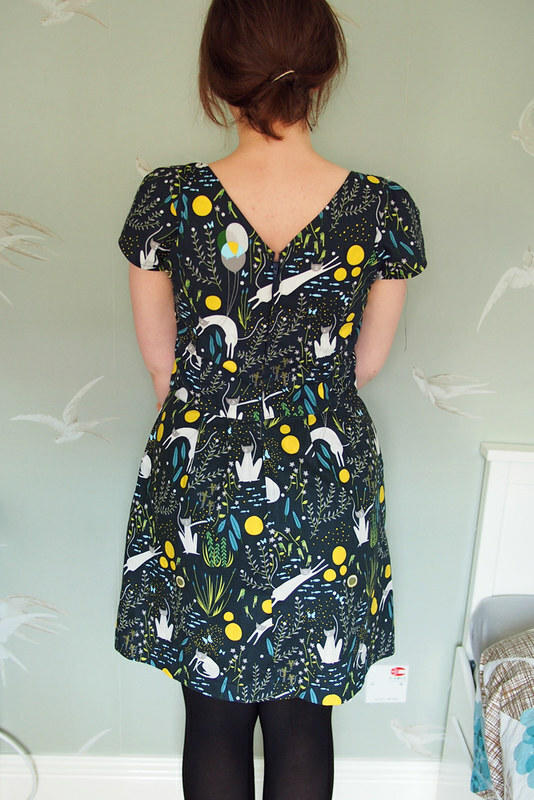 Lovely dress, well made, fab fabric – great!!! It’s gorgeous! Perfect fabric and pattern combo. It looks so great on you, I think it should be in your everyday wardrobe! Totally love this fabric! 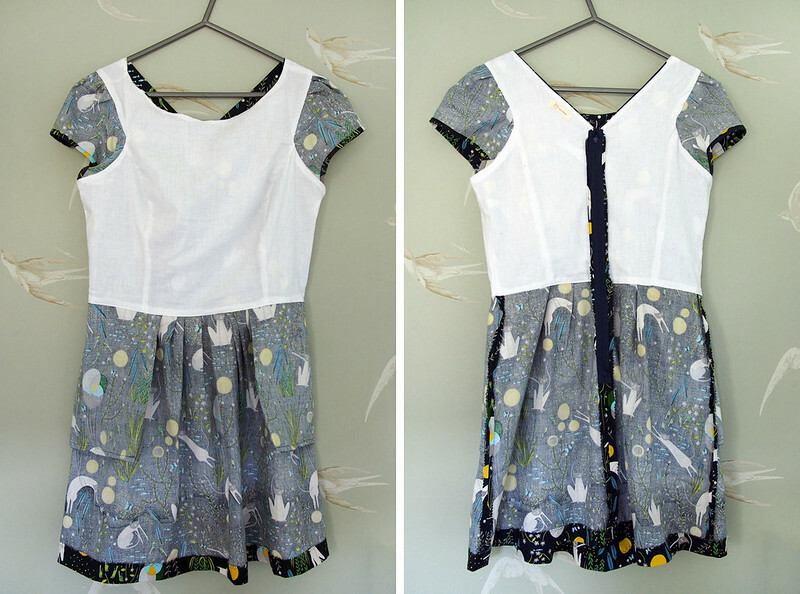 The dress looks fabulous on you – a very inspiring make! Wow so lovely, I have to try this pattern! It’s so flattering too. This is great – I love the fabric! Everyone needs a fun dress to brighten up the everyday wardrobe every now and then! You made it?! Whaaaaaaat?! The creativity I come across blows my mind. Do you sell these? If so, how much do you charge? 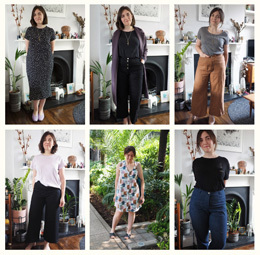 I’d love to pick a fabric and have you make me one! Kitteh Dress!! I’m in love. Great fabric and I like this pattern. I like dresses and tops with a back V-neck. Why should the front have all the ‘party’? Kitty seems to approve of your dress, for sure. Beautiful dress! Love the fabric. Funky but not OTT. 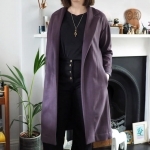 I know this post was some time ago but you could potentially make a little inverted box pleat in the front centre to reduce the neckline gape.